From early in childhood, Jestina Howard knew she wanted to work in the beauty industry. She’d sneak her sister’s cosmetics to school in her backpack and make up her friends in the girls’ bathroom during lunch. Back then, she was paid in dessert currency, but today, she’s paid in money. Her customers are women in search of quality cosmetics and a fresh, new look, which they find in Jestina’s line of cosmetics calledAware. Welcome today’s FACES of Birmingham profile, Jestina Howard! I always knew I would work in the beauty industry from the time I was a little girl. In the seventh grade, I would take the cosmetic products my older sister would give me to play with at home and sneak them to school in my backpack. I didn’t take the products to put on my face, I took them to make up my “clients” (i.e. classmates) in the girls’ bathroom during lunch period! I got paid in desserts or snacks, instead of cash. I got in so much trouble at school and at home for doing that! When I got to high school, I continued to do makeup for classmates, and I also worked at Pizitz Department Store in the cosmetics department. By the time I graduated high school, I was doing freelance makeup for local hair and fashion shows. I got my first degree in fashion merchandising and had a long, wonderful and fun career as a fashion stylist and then a PR/special events manager both for Parisian/Saks Inc. corporate offices. I also worked for several cosmetics companies, salons and spas over the years. I got my first big job doing print advertisements forWeight Watchers Magazine, and from there I was referred to others and was getting a lot of great paid jobs with major ad agencies and corporations. I eventually got two agents, one in Birmingham and one in L.A., to help me get more work in the industry. I decided to create my own cosmetics line when clients started asking me where they could purchase the products I used on them. I remember one client asked me, “Why don’t you have your own line of products?” and then a lightbulb went off in my head! In 2003, I launched Aware Cosmetics and the rest is history. I was born in Birmingham and grew up in a neighborhood called Sherman Heights in the Ensley area. As a makeup artist, what are some of the biggest mistakes women make when doing their own makeup? I notice that some women just don’t put on enough makeup, and by the end of the day, it looks like they are not wearing anything at all. I tell them to put a little more product on so you can see it. Use eye and face primers to hold makeup in place and finishing powders to knock off the shine. The whole contouring and highlighting craze has some ladies looking a bit like drag performers during the daytime. In this case, less is more! Do you have some drugstore finds that you want to share with our readers? I absolutely love, love, love to shop for products in drugstores like Walgreen’s, CVS and Walmart! A few of my favorite products are L’Oreal Lash Out and Voluminous mascaras, NYX Cosmetics gel eyeliners and lipliners, Milani powder foundations, Wet N’ Wild eyeliner pencils, Equate makeup remover and Hard Candy, Cover Girl and Olay skin care products. You don’t have to spend a lot to look great. 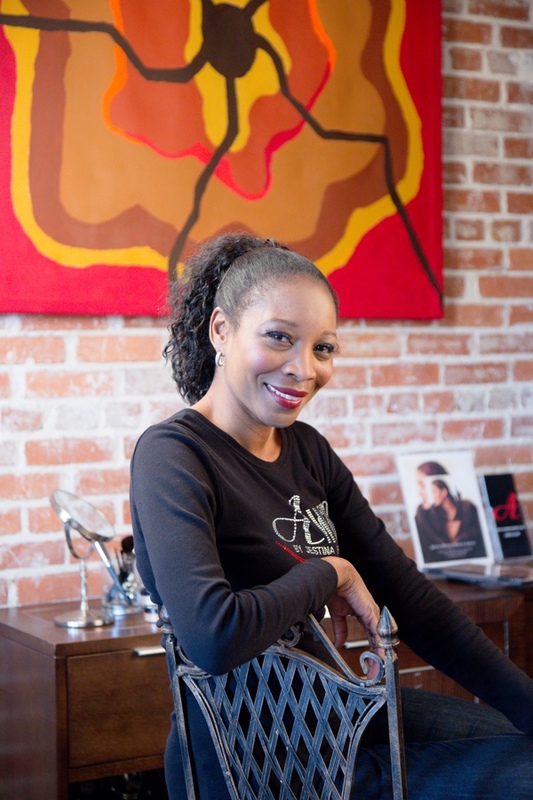 Jestina Howard is the creator of the Aware line of cosmetics. I know that you do a ton of weddings. What words of wisdom can you give brides when it comes to their makeup? Can you give us your thoughts on Southern style, especially as it pertains to Birmingham? Style in Birmingham now is very fashionable, with a twist of quirkiness to create your own individual look. It’s not all about cowboy boots, monogrammed items and linen outfits anymore. If you could have dinner with four people in your business, who would they be? 1. Pat McGrath, British makeup artist and Procter & Gamble’s Global Creative Design Director. She creates unbelievable makeup looks for print ads and runway shows for fashion designers such as Prada, Lanvin and Dolce & Gabbana. My dream is to do makeup backstage during Fashion Week with her. 3. Bobbi Brown, makeup artist and founder of Bobbi Brown Cosmetics. I admire how she started her career by creating 10 basic lip colors and getting Henri Bendel’s to carry them. Now, Bobbi Brown Cosmetics are sold in several other major department stores throughout the United States. 4. Karl Lagerfeld, German fashion designer and Andre Leon Talley, former editor-at-large at Numero Russia magazine and former American editor-at-large for Vogue magazine for three decades. I know these two divas are not makeup artists, but they have had fabulous careers in the fashion industry and I’m sure would have wonderful stories to tell. If you were stranded on a desert island, what are three things you would want in your cosmetics bag? I would need Evian Facial Spray, Equate SPF50 Sport Sunscreen Spray, and Aware Cosmetics Couture Runway Lip Lacquer. I love going to salsa dancing parties! It’s so much fun, and I get a really good workout. I actually have two places I love going to on a regular basis. The first place is Surin West Thai restaurant. I usually eat the Thai noodle dish and and sushi. My second favorite restaurant is Oak Hill Bar & Grill in Homewood. They have the best lunch specials and delicious lemon ice box pie. Every Day a Friday — How to Be Happier 7 Days A Week, by Joel Osteen, and Why Women Should Rule the World, by Dee Dee Myers. Jestina Howard shows off some of her wares. In Birmingham, we have a free concert series during the summer that takes place on Sunday afternoons in various parks throughout the city called Jazz in the Park. The concert series presents over 200 emerging and established artists, and all you have to do is take your blanket, chair, snacks and beverages and relax under a shade tree. I love attending because there’s always a diverse audience in attendance that has one thing in common—just enjoying great live music! I had to start anew after the 2011 tornado damaged my home, and during that very challenging time this question rang true. I realized material things really don’t mean much … you can always buy more things. But photos, memorabilia and family keepsakes sometimes can’t be replaced, and those things are what I can’t live without and hold dear to my heart. Thank you, Jestina, for sharing of yourself with our readers today. To learn more about Aware Cosmetics, visit the website at awarecosmetics.com. Thanks to Gary Clark of The Gary Clark Photography for today’s beautiful images.